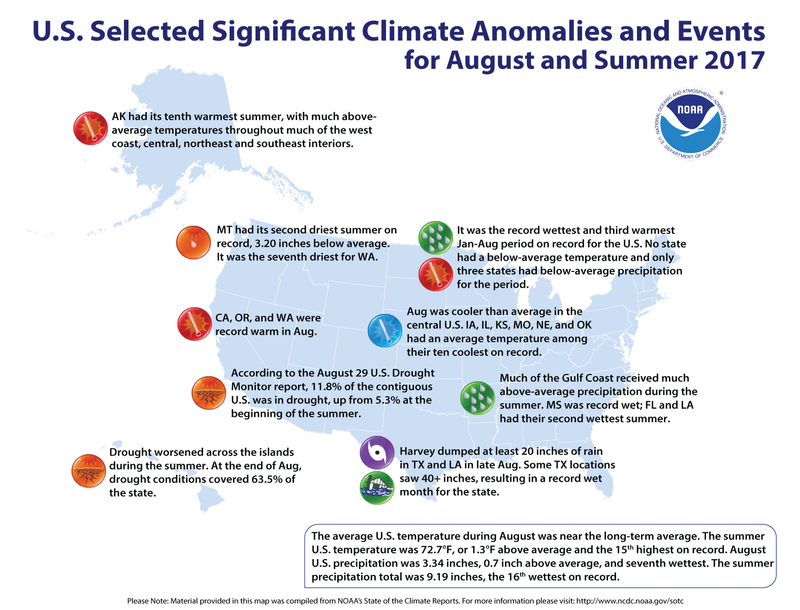 Driven by record warmth in the West, the national average summer (June–August) temperature for the contiguous U.S. was 72.7°F, 1.3°F above average and the 15th warmest summer in the 123-year period of record. The season’s precipitation averageof 9.19 inches was 0.87 inch above average and the 16th wettest summer on record. For the month of August, much-below-average temperatures in the Midwest and High Plains offset the record warmth along the West Coast. The August national temperature was near average at 72.0°F, 0.1°F below average, tying 1921 as the 53rd coolest on record. 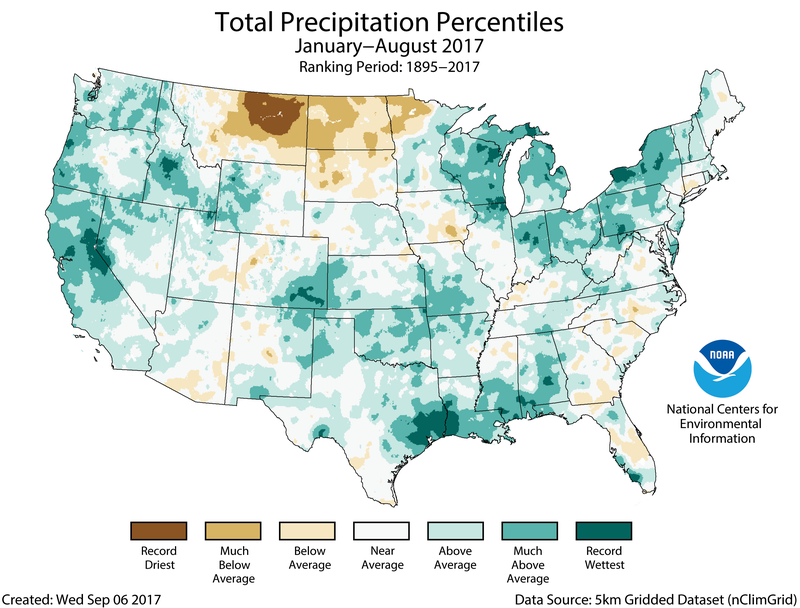 The August precipitation average for the contiguous U.S. was 3.34 inches, 0.7 inch above average, the seventh wettest in the 123-year period of record. See all August, summer, and year-to-date U.S. temperature and precipitation maps. This monthly summary from NOAA's National Centers for Environmental Information is part of the suite of climate information services NOAA provides to government, business, academia, and the public to support informed decision-making. 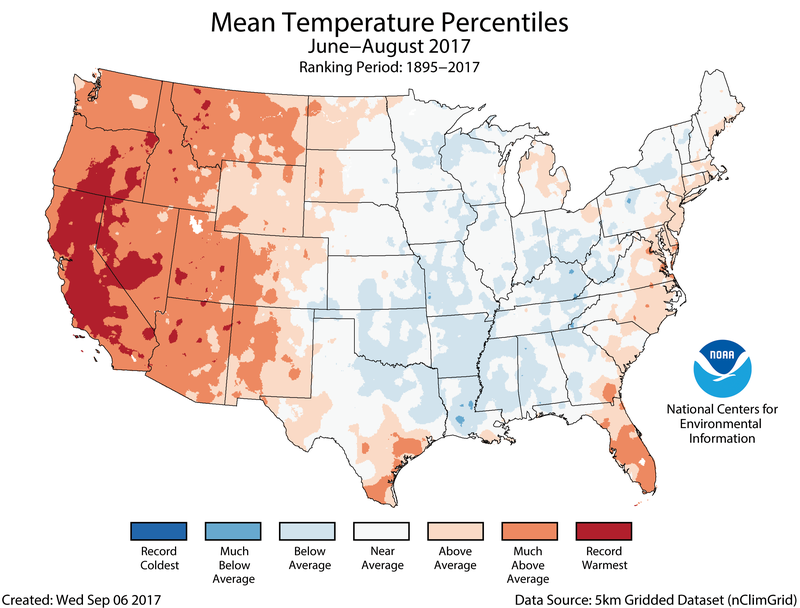 Above-average temperatures spanned the western third of the country. California and Nevada were record warm, and six additional western states had temperatures among their 10 warmest. This was California’s second consecutive record warm summer; its last four summers are among its five warmest. 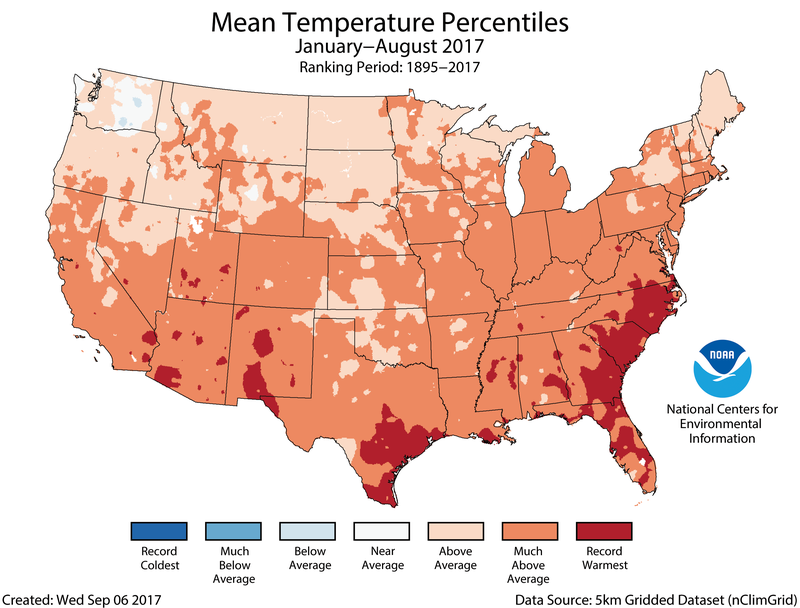 Nine states in the South and Midwest observed a cooler-than-average summer in 2017. This was primarily a result of cooler-than-average afternoons across these regions. Seventeen of the past twenty summers, including the last seven, have been warmer than average. Mississippi observed a record amount of summer precipitation at 20.75 inches, 7.75 inches above average. This exceeded the previous record set in 1989 by 0.41 inch. 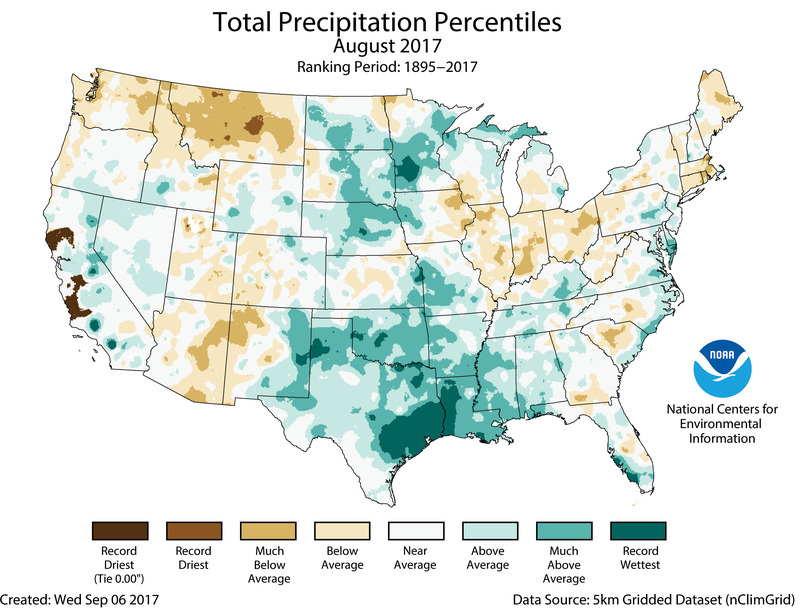 Alabama, Florida, Louisiana, and Texas also had much above average precipitation for the season. The Northwest, Northern Plains, parts of the Midwest, and parts of New England experienced a dry summer. Montana had its second driest summer on record, 3.20 inches below average, reflecting worsening drought conditions during the season and setting the stage for extensive wildfires. Although the nation on average was wet, drought expanded during the season, most notably in the Northern Plains, according to the U.S. Drought Monitor. Nationally, 11.8 percent of the contiguous U.S. ended the season in drought, up 6.5 percentage points since the beginning of the summer season. Montana’s drought coverage ballooned from 0.0 percent to 90.2 percent during the season, with nearly one quarter of the state in the most severe classification (D4, “Exceptional Drought”). Similarly, drought grew during summer in North Dakota from 24.1 percent coverage to 65.8 percent coverage, and in South Dakota from 20.4 percent to 68.9 percent. The U.S. Climate Extremes Index (USCEI) for the summer was 24 percent above average and the 16th highest value on record. On the national scale, extremes in warm maximum and minimum temperatures were much above average. The USCEI is an index that tracks extremes falling in the upper or lower 10 percent of the record. The index covers land-falling tropical cyclones, temperature, precipitation, and drought across the contiguous U.S. 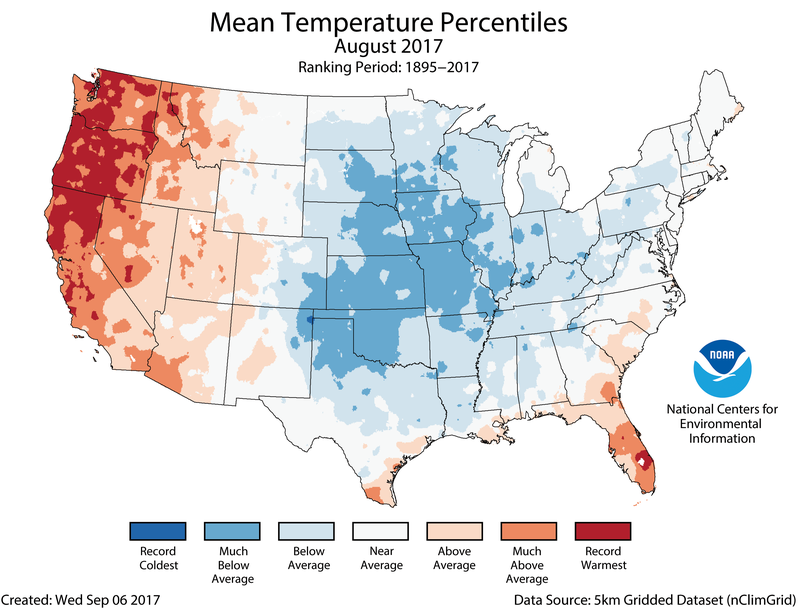 Although the August temperature was categorized as near-average nationally, there were stark regional differences. The western U.S. was very warm, while the central U.S. was quite cool. California, Oregon, and Washington each had their warmest August on record. The California statewide average temperature of 77.8°F tied with 1967 and 2012 at 4.1°F above average. Oregon’s average temperature was 69.8°F, 5.9°F above average. Washington’s was 68.7°F, 5.2°F above average. Average temperatures in parts of the High Plains and Midwest were much below average for August, owing especially to much cooler than average afternoons in the region. Missouri had its seventh coolest August on record with an average temperature of 72.0°F, 4.0°F below average. It was the eighth coolest in Iowa and Kansas, the ninth coolest in Oklahoma, and the 10th coolest in Illinois and Nebraska. Texas was record wet, mostly due to powerful and slow-moving Hurricane Harvey and its remnants. Precipitation across the state averaged 6.57 inches, 4.26 inches above average. Louisiana averaged 12.64 inches, 8.0 inches above average, resulting in its second wettest August, 0.38 inch shy of the record set just in 2016, which also saw widespread very heavy rainfall and flooding. Locally in areas of Texas and Louisiana, precipitation amounts were historic due to Hurricane Harvey. At least 22 stations reported more than 500 percent of normal, or five times their normal rainfall for August. Monthly totals in excess of 40 inches were recorded by long-time NOAA observers in Lumberton, Beaumont, and at the Houston National Weather Service office. According to the August 29 U.S. Drought Monitor report, 11.8 percent of the contiguous U.S. was in drought, relatively unchanged since early August. Drought and abnormal dryness contracted across the Plains, in Alaska, Puerto Rico, and the Southwest and Mid-Atlantic regions. Drought and abnormal dryness expanded or intensified in the Pacific Northwest, northern Rockies, northern High Plains of Montana, and parts of the Midwest, Southeast, Kansas, Maine, and Hawaii. The year-to-date temperature averaged across the contiguous U.S. was 56.7°F, 2.8°F above the 20th century average. This ranks as the third warmest January–August period on record. Four Atlantic states—Florida, Georgia, and the Carolinas—were warmest on record for the period. No state fell in the “Near Average” category or cooler. 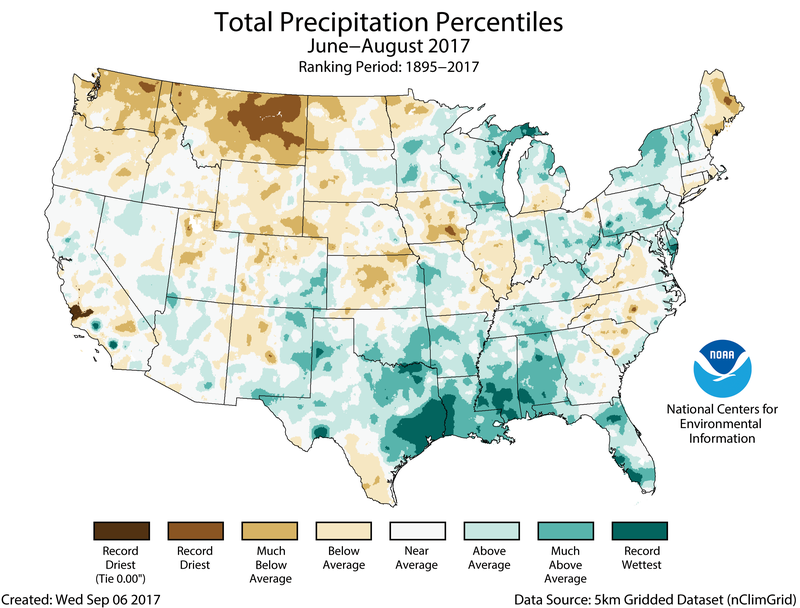 The year-to-date precipitation for the contiguous U.S. was 24.1 inches, 3.4 inches above average, and the wettest in the 123-year period of record. Ten states—scattered in parts of the South, Midwest, Northeast, and West—had precipitation totals among their 10 largest for the period. Only North Dakota (seventh driest) had a year-to-date precipitation considered much below average. According to the October 24 U.S. Drought Monitor, moderate to extreme drought covers 12.0% of the contiguous U.S.